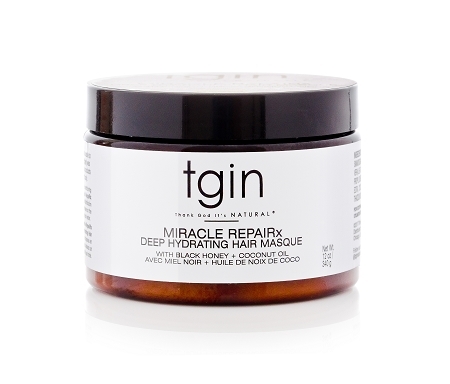 Intensely hydrating, the Miracle RepaiRx Deep Hydrating Hair Mask restores life to dry, damaged, or color treated hair with healing black honey and moisturizes with coconut oil, smoothing and softening the hair. Improves shine and manageability, locks in moisture and repairs damage, while reducing shedding and breakage. Made without parabens, sulfates, petrolatum, lanolin, artificial colors, or animal testing. Directions: After shampooing with Miracle RepaiRx Moisturizing Shampoo, and conditioning with Miracle RepaiRx Revitalizing Conditioner, apply a generous amount of Miracle RepaiRx Deep Hydrating Hair Mask to hair and comb through to ensure distribution from roots to ends. Place a plastic cap over hair and sit under dryer for 10-15 minutes or leave on the hair for 35 minutes to 1 hour without heat. Rinse thoroughly with warm water, followed by cool water. INGREDIENTS: WATER, RAW BLACK HONEY, OLEA EUROPAEA (OLIVE) FRUIT OIL, AGAVE AMERICANA LEAF (AGAVE) EXTRACT, CARICA PAPAYA FRUIT (PAPAYA) EXTRACT, GINGER ROOT (GINGER) EXTRACT, GARDENIA TAHITENSIS (MONOI) FLOWER EXTRACT, EUTERPE OLERACEA (ACAI) FRUIT EXTRACT, SCLEROCARYA BIRREA (MARULA) SEED OIL, SIMMONDSIA CHINENSIS (JOJOBA) SEED OIL, ALOE BARBADENSIS (ALOE VERA) LEAF JUICE, COCOS NUCIFERA (COCONUT) OIL, STEARYL ALCOHOL, CETYL ALCOHOL, STEARAMIDOPROPYL DIMETHYLAMINE, GLUTAMIC ACID, FRAGRANCE, BENZYL ALCOHOL, EDITA, CYCLOPENTASILOXANE. DIMETHICONE, METHYLCHLOROISOTHIAZOLINONE, METHYLISOTHIAZOLINONE. This is my first time using a hair mask and I am in love. I love how creamy it is and my hair felt so restored after I rinsed it. My hair adores a good hair mask. I felt like I was at the spa using this. My hair is really thick and its hard to find products that last, are quality and dont cost an arm and a leg. You will not be disappointed with this creamy mask my hair could not get enough. I love this hair mask. My hair is severely damaged from pretty much anything you can to do to damage hair believe me I’ve done it. I just started using it after the Black Friday sale and so far my hair is already feeling softer. It detangles really easily and makes my hair feel really smooth. My hair never felt better. Okkk! I could eat this stuff it smells so good! My hair never felt better. It’s growing like a weed and feels so soft each time I dc with this mask. I have really loose curls and thought this product might have overpowered that but it doesn’t my hair feels great when I deep condition it.